How Did Obara Sand manage this? In the final episode of Game of Thrones season five, Ellaria and Doran Martell with her daughters, the King of Dorne were seeing off Myrcella, Trystane, Jaime and Bronn who were leaving for Kings Landing. The last season left off at the sequence where Myrcella falls, and then Ellaria is shown bleeding from her nose, due to the poison she used to kill her. Now in the season 6 premiere, we see Jaime arriving in Kings Landing (it is right now almost sun down). The show then takes us to Dorne, Ellaria with one of her daughter is in the same clothes as they were in last season. So it is the same day from the final season, only that it just got brighter instead of darker. They get the message about Myrcella, then Doran is killed. Next Trystane is killed (who is seen painting the stone that is put on the eyes of the dead, so he must be in Kings Landing for Myrcella's funeral) but suddenly Obara Sand appears. What's going on? It makes no sense, the first sequence shows Jaime in Kings Landing, the next show Ellaria and Doran talking and it seems like they have just returned from the port. Prince Trystane was assassinated while on a ship that was at King's Landing some time after the assassination of Prince Doran. The episode doesn't really make this clear, because events in Game of Thrones can be quite apart in time, despite being shown in a linear fashion. You are completely correct. The events in Dorne do appear to happen directly after the last episode of Season 5. However since Prince Trystane was on a ship that went to King's Landing, some time must have passed. How much time? I'm no sailor but the distance between the two looks quite big and I would guess at least several weeks. 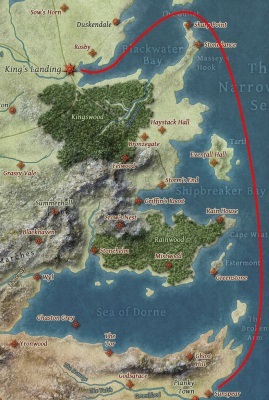 Presumably Obara and Nymeria Sand also sailed to King's Landing just behind Trystane Martell. Things are being shown happening at very different times. Further evidence for this is that the events at Castle Black all appear to happen in a single day in the episode. I.e. the men watching over Jon Snow and later being confronted by Alliser Thorne. Simple explanation, Trystane was sent back by Jaime to Dorne. The Princess Myrcella died by poison on our return journey. 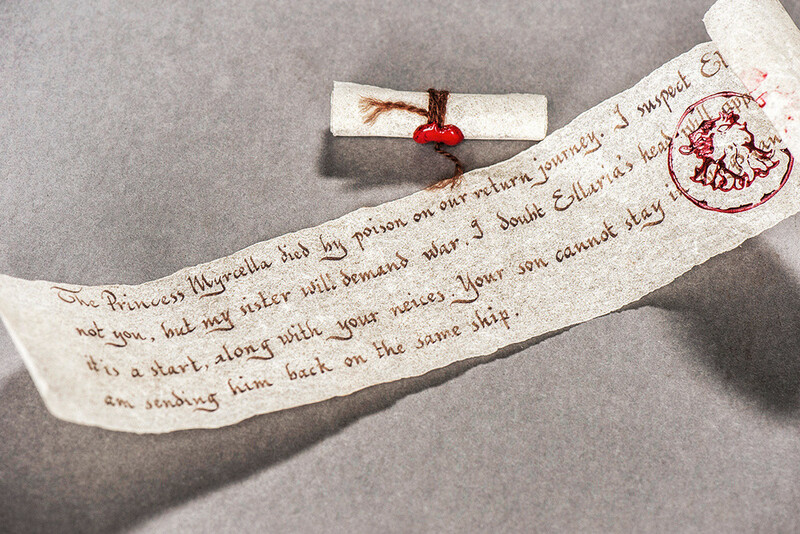 I suspect Ellaria and not you, but my sister will demand war. I doubt Ellaria's head will appease her but it's a start, along with your neices. Your son cannot stay in King's Landing so I am sending him back on the same ship. asap, Jaime writes to Doran about Myrcella's death. Just this moment Ellaria and the her daughter assasinate Doran and his bodyguard. Ellaria and her daughter wearing 'the same' clothes as on Jaime's departure isn't a point since all in Dorne seem to wear the same yellow-fashioned sandy style clothes every day as a sign of their dornish identity. Not the answer you're looking for? Browse other questions tagged plot-explanation game-of-thrones . Why didn't the Dornish prince go with Jaime Lannister on the boat to King's Landing? Where exactly was Trystane Martell in “Red Woman”? How did Cobb manage to go to sleep and dream to save Saito after Mal's death? What happened to Myrcella Baratheon? How did Ant-Man manage to get big again? Why did she bring flowers to the tomb? How did the Wights get the chain for doing this? How did this army get here? How did they manage the return home? How did Leia manage this feat? Why does Varys support the Targaryens?